ZodiacKillerFacts.com and the Document Gallery have been updated to include the suspected Zodiac forgery mailed in Atlanta, Georgia during the notorious “Atlanta Child Murders.” The letter was postmarked March 8, 1981. The author claimed to be the Zodiac and signed the message with a crossed-circle symbol. 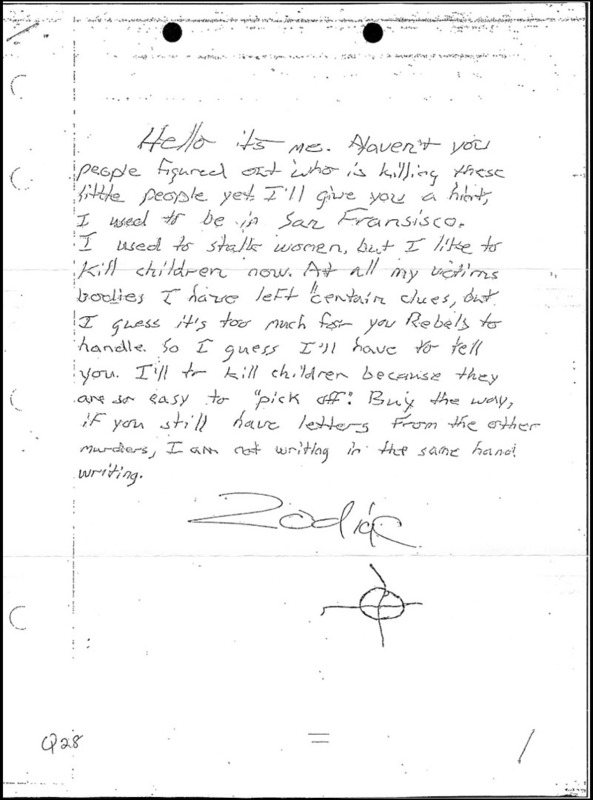 VIEW the letter and corresponding pages from the FBI files regarding the Zodiac case. On February 19, 2011, the popular television series AMERICA’S MOST WANTED aired a repeat of its previous segment regarding the unsolved “Zodiac” murders. At the end of the broadcast, host John Walsh asked viewers for help in identifying an “unknown man” who appears in a photograph with Zodiac victim Darlene Ferrin. The photograph in question was recently posted online by Tom Voigt, the owner of the website Zodiackiller.com. Voigt claimed that Darlene’s sister Pam had identified the man in the photograph as Voigt’s pet suspect, Richard Gaikowski. Voigt never mentioned that he and many others knew that Pam had suffered from “severe credibility issues” and instead implied that Pam was a credible witness who had made a valid identification of Gaikowski. After many observers noted that the man in the photograph was not Richard Gaikowski, Voigt then suggested that the man was Zodiac victim Bryan Hartnell. Observers also noted that the man in the photograph was not Bryan Hartnell, raising questions about Voigt’s motives for suggesting otherwise. Most observers noted that the “unknown man” appears to be Darlene’s ex-husband, to whom she was married at the time that the photograph in question was reportedly taken. The man in the photograph has his arm around Darlene and she has her arm around him, as if they are a couple. The man is wearing what appears to be a wedding band on his left ring finger– the appropriate place for a wedding band. The photograph was apparently taken by someone in Darlene’s family, sometime in 1966 or 1967. According to her family, Darlene left Vallejo in October 1965 after some disagreement with family members. She later met Jim Phillips and the couple married in January 1966. Darlene and Jim lived in various places before returning to Vallejo in October 1966, and remained married until they divorced in June 1967. This timeline coincides with the time period in which the photograph was reportedly taken– sometime in 1966 or 1967. Darlene and Jim were married only during the years 1966 and 1967, so if the man in the photograph is Jim Phillips then the photograph was most likely taken sometime between October 1966 and June of 1967. Darlene and Jim were obviously romantically involved at that time, and Darlene and the man in the photograph appear to be involved in a romantic relationship. The man is wearing what appears to be a wedding ring, and Jim Phillips was married to Darlene at that time. The man in the photograph has the same hairline and facial features as Phillips and he appears to be the same height (a few inches taller than Darlene). Logic, common sense and the facts strongly indicate that the man in the photograph is Jim Phillips and not some “unknown man” who may have been involved in Darlene’s murder. In order to believe that the man in the photograph is not Jim Phillips, one must also accept and endorse the following scenario: Darlene is married to Jim Phillips, and she has returned to Vallejo to introduce her husband to her family. While she is in Vallejo and married to Jim Phillips, Darlene poses for a photograph, in front of at least one member of her own family, with a man who looks very much like Jim Phillips but is not Jim Phillips. Despite the fact that she is married to someone else, Darlene poses with this man as if she is romantically involved with him. At the same time, the man is wearing a wedding ring, indicating that he, too, is married but is also willing to pose with Darlene as if he is romantically involved with her and is willing to be photographed with her in such a pose. This scenario may seem reasonable to those who believe that Darlene Ferrin was a promiscuous and immoral woman who flaunted her infidelity with countless men, however, the above scenario will be immediately recognized as implausible, if not laughable, to those who are reasonably intelligent and utilize common sense. The bogus mystery of the “Unknown Man” is based on the myth that the evidence indicates that Darlene Ferrin had known her killer. While this theory has been spread by Darlene’s sisters, author Robert Graysmith, and others, there is no credible evidence that Darlene had known her killer and there is no legitimate reason to suspect that she was targeted by her killer rather than selected as a random victim. Over the years, a few investigators have made statements that they believed that Darlene may have known her killer but virtually every single one of these individuals will now refute those statements and/or concede that their previous opinions were based largely on the many myths regarding Darlene which have been spread by Darlene’s sisters, Graysmith and others. The hundreds of pages of police reports regarding the Zodiac investigation provide no credible evidence to indicate that Darlene had known her killer. Police did investigate this possibility but found no evidence to support that theory, and the overwhelming consensus among the investigators was that the Zodiac did not know his victims. In order to believe that the many myths regarding Darlene Ferrin are true, one must also accept and endorse the following scenario: Darlene tells her sisters Pam and Linda, and others, that she is being harrassed, followed and stalked by a mysterious and menacing stranger. Darlene tells Pam that this man is bothering her because she had seen him kill someone. Pam sees this man on eight different occasions, including the now-infamous “painting party” described in Graysmith’s book, when a sinister stranger dressed in a suit scared Darlene. A few months after the party, Darlene is murdered. Police immediately interview Pam, Linda and many others, asking the same questions: Do you know anyone who would have reason to harm Darlene? Do you know of anyone who was bothering her? Pam, Linda, and everyone else who knew about the stalking murderer fail to mention him to police and say nothing about the entire situation. Then, eight years after Darlene’s murder, Pam, Linda and others start talking about the stalker, but they only seem to tell the most troubling stories to reporters and TV crews. This scenario may seem reasonable those who lack critical thinking skills or have suffered a severe head injury, but this scenario will immediately be recognized as absurd to anyone who utilizes common sense. Whenever I am asked about this issue, this is my response: If someone I loved had told me that they were being followed and stalked by a murderer, and then that person was murdered, I would most certainly mention this seemingly important fact when the police asked me if I knew of anyone with reason to harm my loved one. Those who continue to spread the many myths about Darlene Ferrin must also believe that her sisters loved her so much that they would continue to search for the killer decades after her death but, in the hours, days, weeks, months and years after Darlene was killed, Pam and Linda just couldn’t be bothered to tell police that she was terrorized by a murderer– even when police asked for this kind of information.